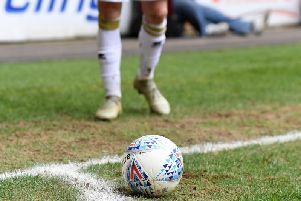 Callum Brittain and Keith Millen have come out in support of troubled keeper Wieger Sietsma following another costly mistake at Bradford City on Tuesday. Siestma fumbled at another ball, gifting Nat Knight-Percival the chance to double Bradford’s lead, wrapping up a 2-0 win. Since making his debut for the club in August, Sietsma has played eight games, conceding 19 goals - eight in his last three appearances. Defender Brittain though said the team are fully behind the troubled Dutchman. “We all make mistakes, my crosses weren’t great tonight,” he said. “Even if Wieger made a mistake which cost us a goal, we’re a team. We win together, we lose together. Manager Millen too defended the keeper, saying the 22-year-old has come into a difficult situation but felt there were plenty of mistakes in the build-up for both of Bradford’s goals. He said: When you look back at the goals, there are other mistakes so I’m not just blaming the keeper, I’d never blame just one individual. “Sometimes though you need your keeper to make saves and be man of the match, sometimes they don’t. “If we’d won both headers at the set pieces, he wouldn’t have to make the saves.It’s a group thing, conceding goals and scoring goals too. "I don’t really remember him making any other saves really, it wasn’t like they were peppering the goal. The two goals, from a team point of view, were soft. “The trouble with keepers is when they make a mistake, or even half a mistake, it leads to a goal. That’s the reality of hte postiion. “He’s come into a team that has struggled with confidence, in a bad league position and it has been tough. He works hard, he’s a great pro, he’s out there every day backing Lee (Nicholls).